With funding from the NC3Rs, Dr Matthew Leach, Newcastle University, has demonstrated that these facial action units increase in intensity in response to post-procedural pain, and could therefore be used as part of a clinical assessment. 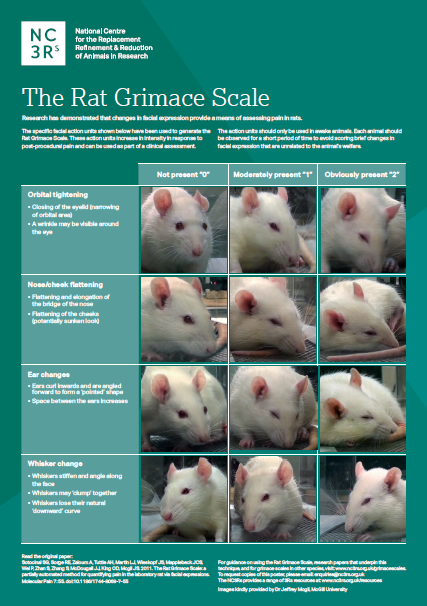 The NC3Rs has produced A3-sized posters of the mouse, rabbit and rat grimace scales for display in laboratory animal facility rooms and corridors, to help raise awareness about the scales and familiarise staff with the specific facial action units. These posters are available in English and French. To request copies of the A3 posters, please email: enquiries@nc3rs.org.uk (provide a full postal address and quantity/type of posters required). The posters are free of charge and there are no shipping costs. 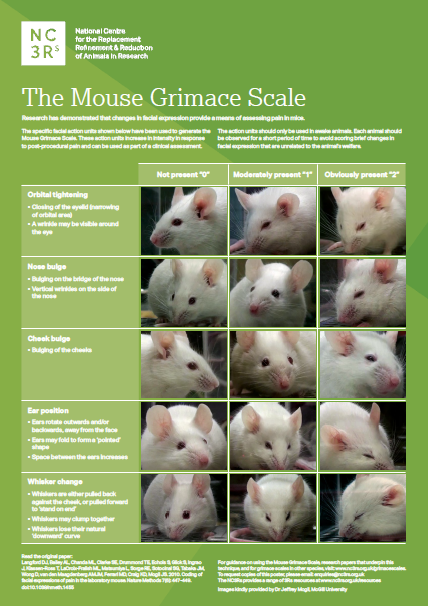 See the links below for guidance on how to use the grimace scales and research papers that underpin and validate this technique.